Download a blank fillable Dd Form 93 - Record For Emergency Data in PDF format just by clicking the "DOWNLOAD PDF" button. 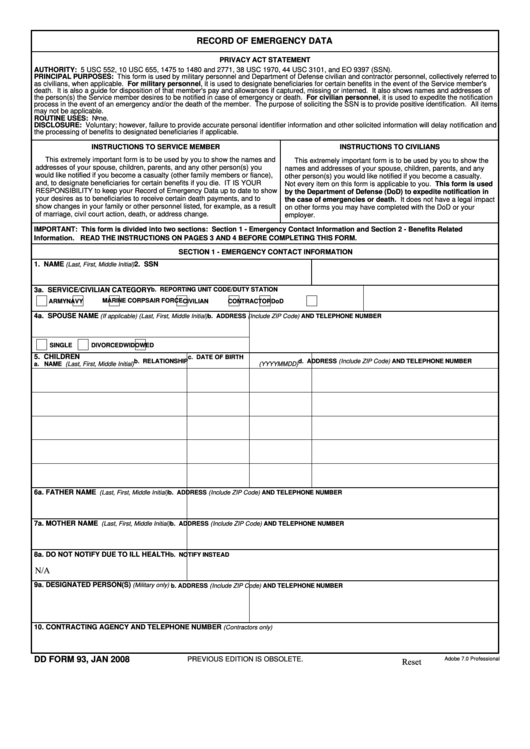 Complete Dd Form 93 - Record For Emergency Data with your personal data - all interactive fields are highlighted in places where you should type, access drop-down lists or select multiple-choice options. AUTHORITY: 5 USC 552, 10 USC 655, 1475 to 1480 and 2771, 38 USC 1970, 44 USC 3101, and EO 9397 (SSN). the processing of benefits to designated beneficiaries if applicable. other person(s) you would like notified if you become a casualty. of marriage, civil court action, death, or address change. Information. READ THE INSTRUCTIONS ON PAGES 3 AND 4 BEFORE COMPLETING THIS FORM.